Although smallest of the Canaries, El Hierro remains blessed. It has some of the most beautiful landscape not only in the archipelago but also the world. The island, featuring several protected natural and rural parks, has a majestic yet diverse terrain. From ancient Laurel forests to arid terrains and volcanic peaks, it is also home to the Frontera Rural Park. 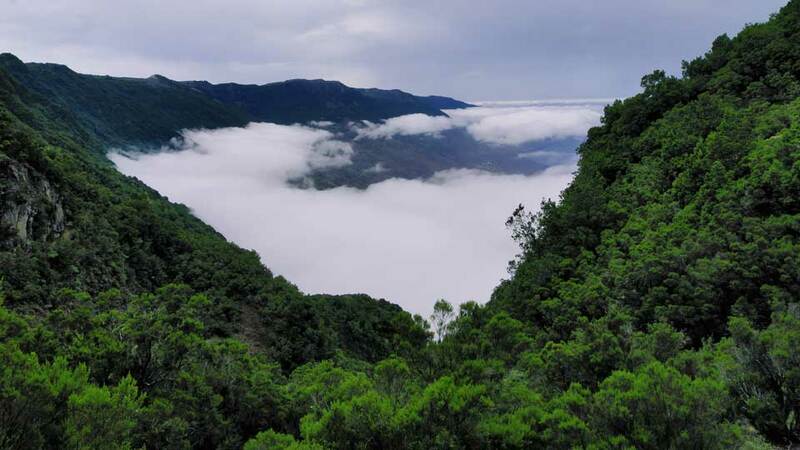 Located in the western part of El Hierro, the park covers an impressive area of 120 km2. Frontera Rural Park is proof that man and nature can co-exist. It’s unique mosaic of landscapes and pockets of small residential areas never fail to surprise visitors. So, gear up and prepare for a day out with nature. Experience first-hand the most diverse and magical natural wonders that are nothing short of awe-inspiring in El Hierro’s largest natural park. Everything an adventure-seeker asks for, Frontera Rural Park can provide. This protected park has dense forests, arid areas and a plethora of activities for its guests. 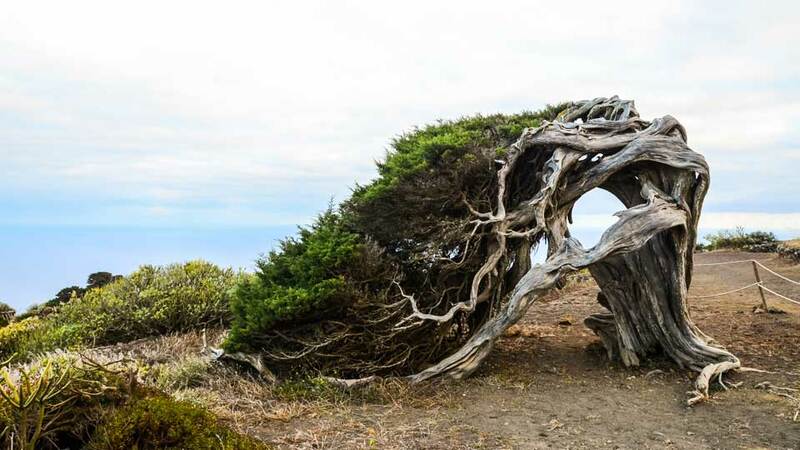 In a day, visitors can see the majestic wind-twisted juniper trees, bath near a marine reserve and stroll down pathways that offer a peek into bygone times. Walk the traditional routes of El Hierro, the same paths taken by the early inhabitants to tend their flocks. Like the rest of the island, peace and tranquility reigns in the southwestern part making strolls to different paths a real pleasure. One of the ideal starting points is the camping area in Hoya del Morcillo. From here, guests may take the route that leads to the fishing area of La Restinga. Others paths take hikers through the dense Laurel forest of Mencafete, eye-catching gulfs and so much more. The steep upward climbs are also well-compensated by the awe-inspiring scenery. Here, visitors have an incredible chance to be one with nature even if only for a brief moment of time. Situated in the west of El Hierro is El Sabinar, a magical open forest that looks straight-out of fairytale books. This forest has incredible centuries-old trees whose ability to adapt to the elements of nature and time often leaves visitors in awe. These gnarled trees look as if they bent to shield themselves from the trade winds. One tree, in particular, known as the Sabina de El Hierro, is a magnificent example. This eye-catching tree’s unique and graceful shape has made it one of the symbols of the island. Furthermore, this type of forest only grows in three places around the world, making it a must-visit spot when in El Hierro. On the southern part of the Frontera Rural Park sits El Julan Cultural Park and Visitor Center. Within the park is a mountain slope of lava flows where the Bimbache tribes hide their cave drawings. The significance of this UNESCO World Heritage Site is showcased at a visitor center. Here, the remarkable exhibitions explain the life of the island’s early inhabitants. In addition to that, the center also organizes tours that lead to the drawings and other interesting sites. El Hierro’s most adored figure, Virgen de los Reyes (Virgin of the Kings), is kept in this sanctuary. Situated between rolling heather hills in La Dehesa, the sanctuary is as quiet and modest as it can be. Painted in white with an ochre roof, this one of a kind church is in stark contrast with the surrounding greenery. A quick visit, on the way to El Sabinar, is a soul reviving experience. Located in the municipality of El Pinar, this lighthouse once marked the Prime Meridian point for 250 years. The light it emitted was also the sign for explorers returning from the New World that they have arrived in Europe. 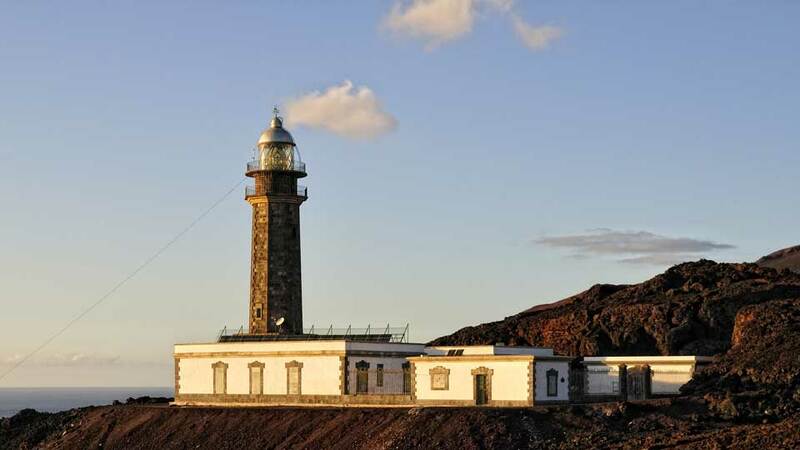 At present, the house is painted in muted white and green with a dark volcanic tower, much like other Canarian lighthouses. Surrounding it are erratic lava flows, volcanic tubes and large tabaiba plants which are prevalent in this part of El Hierro. This monument is most magical during the golden hour when the sun splashes bright colors to the island’s western skies. Located on the southern coast of Frontera Rural Park is La Restinga’s Mar de Las Calmas Marine Reserve. This 750-hectares of deep blue water is the richest marine area in El Hierro. As such, it became a haven for scuba divers and underwater photographers. Guest visiting also often feast on a parrot fish or grouper at one of La Restinga’s top-rated seafood restaurant. The extensive land area of Frontera Rural Park means that there are many entry points. But the ideal place to start especially for hikers is Hoya del Morcillo. This camping ground is approximately 40-minutes away from El Hierro Airport. Visitors may take HI-1, HI-4 and then HI-40 to get to this starting spot. Meanwhile, those who’d like take provisions from the nearest town may start from La Frontera. This picturesque town is about half an hour away from the airport and Puerto de la Estaca seaport. Visitors driving on their own from both areas may take the HI-2 and HI-5 motorways. The thrilling yet sometimes strenuous activities Frontera Rural Park offers will surely take their tolls on the visitors’ energy levels. Thus, feasting on local or international cuisines is the best reward post-park-visit. Savor the tastiest pizza, eggplant parmigiana, and other classic Italian food in Pizzeria El Pinar. This small and modest restaurant features bright yellow interiors adorned by stacks of wine bottles. While dining, visitors can’t help but admire the lovely background music creating a more intimate ambiance. The staff’s attention to details and friendly approach are also worth noting. Visitor’s craving for some fresh meat is in for a treat at Restaurante La Sabina. This family-run restaurant in Las Casas offers the best homemade goat casserole in town. It has a beautiful and cozy atmosphere with warm and friendly staff ready to help out with visitors’ needs. Also, the second floor features a terrace with outdoor seating. Here, diners can take in the stunning view of Las Playas and the ocean below. Sample some of the best Venezuelan dishes at Bar Joapira Restaurant. Run by three friendly ladies, it offers delicious cachapas (stuffed corn pancakes) and a variety of grilled meat. Situated in an elevated area in the town of Frontera, the outdoor seating boasts expansive ocean views. Dining experiences here consist of feasting on the meals while savoring the delightful majestic vista. One can’t go to El Hierro and not explore even a part of Frontera Rural Park. Its broad land area allows entry from any part of the island. Moreover, some of the most not-to-be-missed sights are spread out but within easy access from the main roads. In a nutshell, Frontera Rural Park is a nature lovers’ paradise. Its diverse landscape that changes on a minute to minute basis seems otherworldly. As such, it is only made better by structures human created to preserve further and showcase the park’s history and significance. The serenity of its immortal spring days is the perfect background music to the astonishing show nature performs here daily. Frontera Rural Park, having all these qualities and more, it’s easy to see why more and more tourists are captivated by the beauty and tranquility of the archipelago’s smallest island.